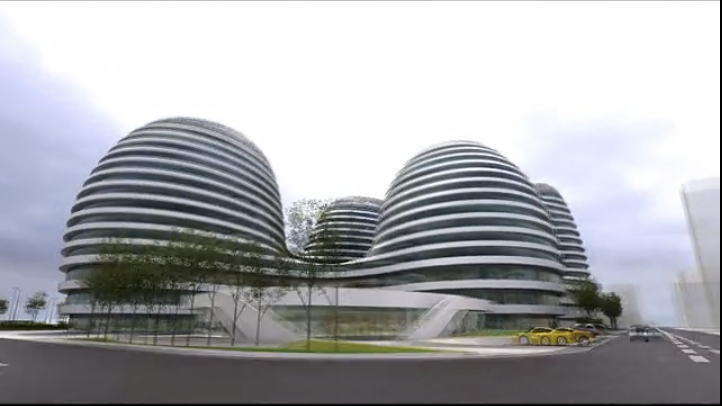 A series of buildings of circles that are piled on top of each other and all rounded structures and curves and white and swirly – that is what the Galaxy Soho building in Beijing is all about. Architect Zaha Hadid, one of the most famous living architects – is probably the most famous female architect. She does these great and huge projects, as well as smaller ones. There are 400 people who work at her firm and they have designed over 950 projects. WOW. Learn more about her architecture firm. Here are some great images that are visualizations of the building, meaning that they are computer-generated images. The building is an office, retail, and entertainment center in Beijing China. No one lives in this building – which is too bad because it seems that it would be a fun place to live in and run in circles. 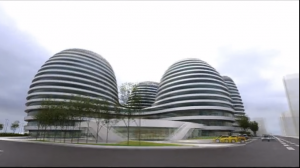 It is a series of five buildings that flow and undulate like piles of white slinky toys. How fun to race around in there! This building was built in 2012.